Picasso made some pretty extraordinary works of art. Nu au Plateau de Sculpteur, 1932, pictured at left, is not one of them. But, proving the old maxim that money and taste aren’t always found hand in hand, the aforementioned painting set a new record price for an artwork sold at auction when the hammer fell at Christie’s in New York on Tuesday night. The going price? US$106.5 million. The sale just narrowly pipped the previous record holder, Giacometti’s Walking Man I, which sold for US$104.3 million at Sotheby’s in London earlier this year (both these prices include buyers’ fees). While I’m at it – as wonderful as Giacometti’s work is, I’d really love to know why his work in particular has been going through the roof of late. Who has the greatest vested interest in seeing his prices go up? That’s not a rhetorical question. I’m genuinely interested in finding out. My inherent suspicion is always peaked when an artist’s market rallies in such a dramatic fashion, particularly when compared with the prices being paid at auction for equally well-regarded peers’ works of art. But, back to Picasso. 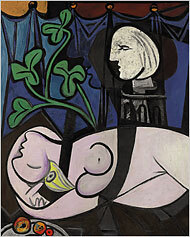 A price precedent has been set for large Picasso canvases for quite some time. Way back in the economic golden days of 2004, someone paid US$104.1 million for Boy with a Pipe, 1905 – in my opinion a far more powerful work than the latest record-breaker. For those fortunate people who managed to hold onto the odd pile of cash in the wake of the GFC, this means that a high-profile Picasso painting is a good place to park said cash while the stock market continues to buck and turn. With the economic and political situation in Europe looking ominous, it’s no surprise at all to find that secure material assets are finding favour amongst investors. Word is that much of this investment is coming from China. The idea of art as material asset really took off in the post-war decades – in 1955, Fortune magazine declared art to be one of the most desirable international currencies. The art market as we know it today, particularly the auction trade, came into its own after then. Whereas previously auctions tended to be the purview of sombre and serious dealers and dedicated collectors, in the 1960s and beyond, they became social affairs as high society and the monied classes tussled over artworks that would bring them cachet and, if they were lucky, a secure way to invest a portion of their fortunes. No matter how unimpressed you are by Picasso’s market-topping painting, for whomever divested themselves of the equivalent of Greece’s national debt (ok – yes, an exaggeration) to acquire it can be pretty certain that their money is safe, as long as the art market status quo remains steady. And there are too many wealthy individuals and organisations heavily invested in said market for it to be undermined anytime soon. And, as an aside, for anyone who questions why Christie’s closed its Australian branch and how Tim Goodman managed to secure what amounts to a Sotheby’s franchise Downunder, consider this – the price for the Picasso painting in Australian kangaroubles amounts to about $118 million. During the boom years 1999-2008, only once did the total… TOTAL … amount of art sold at auction in Australia exceed that amount. The approximate average for that ten year period was about A$90 million. In short? To say the Australian market is small change for the international auction leviathans is something of an understatement.